When "good enough" just isn't... hire a Fear Free® TRAINED Pro with verifiable credentials. Qualifications: Bonded / Insured, Fear Free Certified Professional, Certified Professional Pet Sitter (CPPS), CPR / First Aid trained, Dog Trainer Foundations (Karen Pryor Academy) - Certificate of Completion, Doggone Safe Dog Bite Safety Educator. A loving pet companion to pets in my home for over 40 years. Safe, Professional Pet Care is best left to the experts... and as an expert I know that it is not about how much I love cute pets but how very treasured your pets are in your family. Since 2005 I have been paid as an employee of Choices Pet Sitters (business licensed in Pickens County) to provide professional in-home overnight and drop-in pet care and dog walking services to discerning families in Pickens and North Cherokee Counties. I believe that my clients deserve the best so I continually educate myself in current industry practices to be proactive in protecting your pet while in my care. 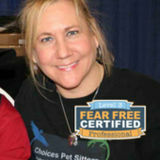 I am one of an elite group of Dr. Marty Becker's Fear Free Level 3 Certified Professional Care Providers working full-time to keep your pets safe, healthy, and happy in your home while you're away. As a non-smoking, BONDED and INSURED multi-credentialed professional, I am experienced in caring for many breeds and species of pets. I am trained in Pet First Aid /CPR, and submit to a yearly 3rd party background check for your piece of mind. My services include light indoor plant watering, collecting your mail and packages, washing all pet food and water dishes before each meal, administration of basic medicines, sweeping and cleanup around pet areas, and filling outdoor bird feeders. Individualized pet care has been my passion for many years. I was raised with dogs, cats, hamsters, ducks, turtles, Bettas, a fresh water fish tank, and a horse while growing up in my parent's home. I even raised Grand Champion White Leghorn chickens in 4-H! But unlike most hobby pet sitters I don't count these years as part of my experience. Those years are just an added bonus because I know that pets in my home behave differently than your pets. I know this because I have been in hundreds of homes and have experienced animal behavior first-hand. Studies in basic human and animal psychology, a calm patient demeanor, and many years of experience with the human-animal bond in various environments help me predict your pet's behavior to keep them safe. With my training and experience I can provide the most relevant care possible for each pet's age, breed, and temperament. If you have other pets, don't worry. My professional pet care services doesn't stop at dogs! I have been caring for cats, pocket pets, mini-farms, and other non-traditional pets for over 15 years. In short, I believe that all stages of life deserve quality care and support. To be there for your pets from 8 weeks to 8 years is an honor. My pet care services respect each stage of life with an appropriate care plan that reduces the fear, anxiety, and stress that can appear when pet owners depart, if even for a short period of time. Avoid travel anxiety. I'll take care of ensuring that your fish are fed, your plants are watered, and that your home is taken care of. Check me out on Facebook: Linda Ross (choicespetsitters) and contact me today! 1.) House Sitting - Basic Overnight Stay rates in your home cover periods from 8:00 PM - 6:00 AM. 2.) Between overnight visits 30 minute drop-in appointments are available during the day for one large dog or two small dogs within an 8 mile service range of 515 and Hwy 53. 45 and 60 minute drop-in or dog walking visits are custom quoted for 2 large dogs, more than 3 pets. 3.) Longer overnight stays, requests from areas outside of my general service range, mini-farm pet care, and specialty or geriatric pet care services will be custom quoted. 4.) For my safety, the safety of your pet, and to be sure your pet gets the care you want, a Meet and Greet before services start is a prerequisite to scheduling. Many dogs will react differently with a caregiver when you are there with them. I will need to assess your dog's temperament, previous obedience training, and energy level to properly care for them. 5.) Reactive dogs will be handled on a case by case basis based on behavior at the Meet and Greet consultation. If the request for service is accepted the visits will incur a $25 per visit surcharge for the additional time required to work with these pets.